Here we have a cabinet photograph of a mature man who looks to be in his 80s. He sports white hair and a thin, wispy white beard. His leathery hands carry a cane as he sits in a carved wooden chair. There are no discernible markings on the back of this photograph. The front indicates that the photographer is "Marratt". It was taken in Mulliken, Michigan, a tiny one square mile village about 20 miles west of Lansing, the state capital. Some newspaper research suggests that the photographer was a William Marratt who had photography studio near Lansing for many years. Here is his obituary in the Lansing State Journal. There are some earlier mentions of Marratt in the same paper in the 1910s. With an approximate birth year of 1864, it seems plausible that Marratt was a professional photographer by the late 1800s. My best guess as to the year this photo was taken is 1890-1900. What do you think? As for the man being photographer I really have no clue. He seems like a distinguished gentlemen who obviously had some means for a professional photography sitting. I wish there were some markings on the back to use as clues. What do you think, feel, and wonder about as you look at his photograph? 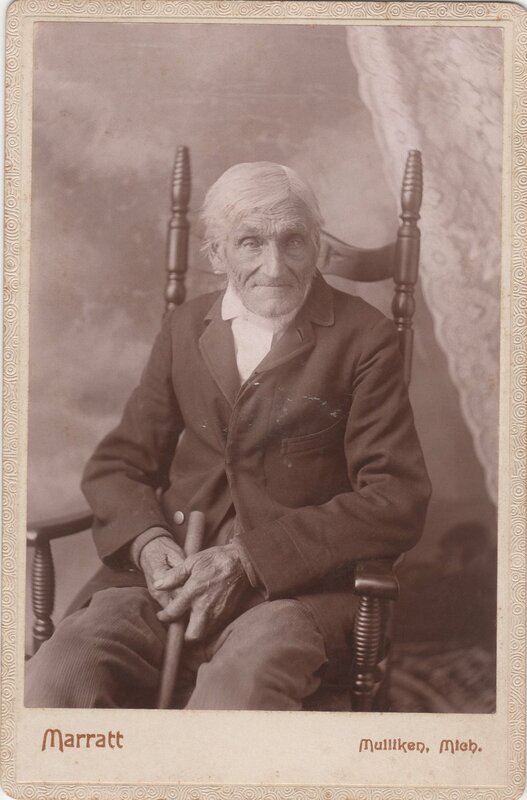 Was this gentleman a prominent citizen of Mulliken? Lansing? How would you go about searching for his identity with so few clues? Would you like a free photo sent to you? If born just a few weeks earlier than her February 17, 1900 birthday, Ida Rhoads Sears (1900-2002) would have achieved the rare distinction of having lived in three different centuries! This is her story.